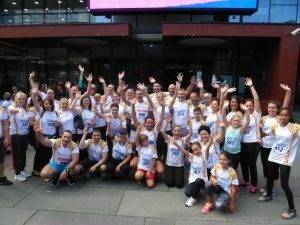 Sarajevo Half marathon took place on 17th of September 2017. The fourth year in row one of the major sport events in town have hosted our team again. Unlike the previous ones, this time our participation was extremely noticeable. Not just that our number of participants was huge, but also our visual presentation was compatible with our new corporate identity. Number of Pharma Maac half marathon participants, for the first time, was four runners. For the Relay half marathon we had two teams with 3 runners. And finally, more than 30 Pharma Maac runners have enjoyed 4 kilometers Fun Run. Without any doubt, highlight of whole event was the demonstration of true Pharma Maac spirit that our team showed. What happened ? Whole team have supported our half marathon runner, Jasmina Zahirović, through her last kilometer. They have joined her and ran next to her in to the finish line. Demonstration of true strength and bond among our employees. Picture that showed what Pharma Maac really is. We are extremly proud on our unity. Picture will explain everything. Enjoy the video that will give you true impression about Pharma Maac’s team spirit.